Gibson’s original Firebird’s burned all too briefly in the company’s catalogue, appearing in mid-1963 and disappearing again in May ’65. The tuner at the tip of an original Firebird’s headstock often came into direct contact with the case it was shipped in, meaning that if it was knocked in transit, the headstock became damaged and, in extreme cases, completely detached. So it’s not unusual to find damage at this point on older models. 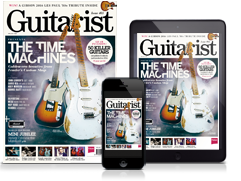 At the time, its radical shape – both in reverse and non-reverse body guises – proved to be too much for the guitar-buying public, even though Fender’s somewhat similarly space-age Stratocaster was rapidly finding its way into the hearts of players worldwide. Blueprinted by car designer Ray Dietrich, who had both the Lincoln and Packard autos on his CV, the idea was that the Firebird’s general appearance should reflect the tail fins of the 50s rides favoured by teenage rock ’n’ rollers of the day. But this attempt on behalf of Gibson to get down with the kids floundered, and the guitar was consigned to the growing stockpile of six-string ideas that very nearly made it. However, Gibson’s ’Bird wasn’t going to go down without a fight; its solid mahogany neck-through body, Fender-ish six-a-side ‘hawk’s-head’ headstock, Kluson banjo-style tuners and other features soon met the eyes of players who were looking for something a bit different, and the guitar began to enjoy a kind of posthumous fame. 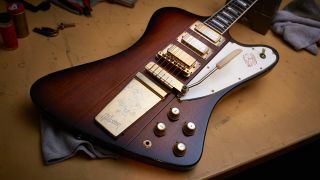 Arguably, it was Johnny Winter who led the charge, but players as diverse as Skunk Baxter, Elliot Easton, Eric Clapton, Mick Taylor and Dave Grohl were ultimately to succumb to its charms, and, today, the Firebird is highly regarded as an instrument that has risen, phoenix-like, from the ashes of a disappointing initial production-run to have its distinctive voice heard across a panoply of the globe’s guitaristas. Guitarist would like to thank Vintage ’n’ Rare in Bath for the loan of this fabulous ’bird.